Exclusive KÜHNLE vehicle type Spider-Phaeton with leather upholstery with buttons, splash board and fenders covered with grain leather. Exclusive hunting carriage made by KÜHNLE. Particular carriage for a multitude of uses. KÜHNLE natural wood Phaeton with removable rear seat. Comes with wooden independent shafts and 2 beautiful carriage lamps. Height seat bench 140 cm, height including driver wedge 160 cm. Very comfortable training and leisure time carriage in very good condition! 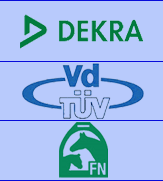 Customer carriage located in Switzerland. 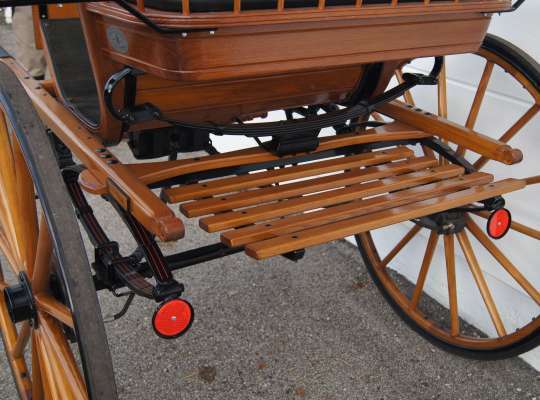 Spider-Phaeton made by other manufacturer equipped with wooden pole and wooden bars. 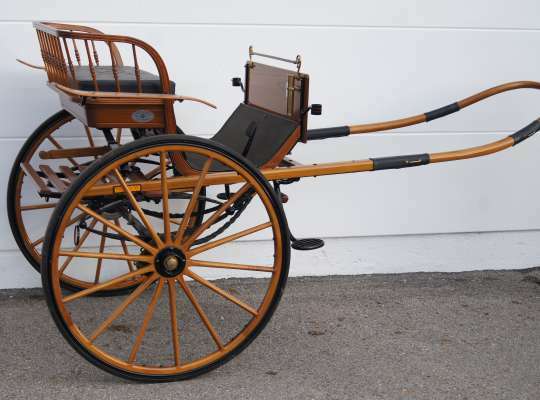 Carriage for sport and leisure time in very good condition. Luggage rack on the rear end above the axle. Removable backrest cushions. Sport and leisure time carriage in nearly new condition. Construction in classical english style, fine hand-crafted work. Black fittings and steps, bordered seat edgings.